March | 2013 | KC & Co.
For years, I have told KC that like Mary Poppins, she is “practically perfect in every way,” so when my mom suggested seeing the National Tour of the musical “Mary Poppins” the answer was an automatic yes. My mom and KC are both March birthdays-one day apart. And we were able to get tickets to see the matinee on KC’s actual birthday. Woo hoo! A teenager at last! Happy 13th. About a month before the show, I noticed a Facebook posting by Medtronic announcing that the actress playing Mary Poppins on the tour was Madeline Trumble, JDRF advocate and Type 1 since the age of 4. I thought how amazing this news was…KC is a huge theatre fan (remember acting camp last summer?) plus she loves singing and dancing. What an inspiration for her to see someone succeeding in a something KC loves! I ended up contacting our local JDRF office and asked if they could help set up a meet and greet. They thought it was a terrific idea and started working on it. I didn’t let KC know because I didn’t want her to be disappointed. The “green light” phone call came the afternoon before the performance. As I watched the performance, my mind was racing. Does she wear a pump? How can she “fly” like that with a pump on? Does she go low or high after a performance? How does her body handle doing two shows some days? And as I read her Playbill bio, I was struck by her thank you to her mom. Yeah, I know, many of the performers thank their parents. BUT….a d-parent knows the struggle that a parent and child with Type 1 go through and the bond forged by that struggle. That “As always-for mom” line was a poignant reminder of that bond. I thought of her mother worrying about this talented young woman whose life is on the road a different city every few days. I thought about my girl and her dreams, ambitions, future. The magic of the show captured my attention and I was able to sit back and enjoy it, although nervously awaiting telling KC about her surprise. But we kept it a secret from KC…..until the performance was over. 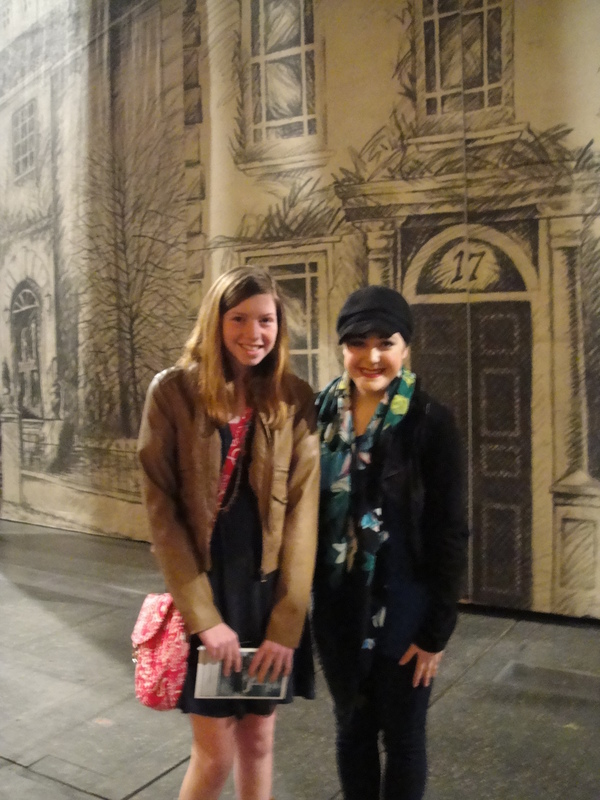 We headed to the stage door and word was sent to Maddy that we were there. After a short wait, a lovely, big-eyed young woman shyly greeted us. There she was! Mary Poppins herself! She graciously gave us a tour of her dressing room, backstage and even led us onto the actual stage. Our conversation ranged from the play itself to how she manages her diabetes on the road. We learned that she wears a purple version of the same pump that KC wears. We talked a1cs, and treating lows. We shared stories of pump alarms going off while on stage. We discussed the difficulty of getting good health care on the road. Maddy said that meeting young people with T1 reminds her to take care of herself. We talked about the latest pump technology and cgms. Her mother wants her to get one and she’d never seen one in person. So KC let her check hers out. We reminded her that if a 13 year old can do it, so can she! Even if the needles are scary big! It was a meeting that reminded me that KC will have a life of her own, out of my control, as it should be. Posted in type 1 diabetes, Uncategorized and tagged Maddy Trumble, Madeline Trumble. Bookmark the permalink.